Mobile SoCs are packed with specialized processors: CPU, GPU, high-performance DSP (compute), low-power DSP (sensor hub), modem DSP (signal processing), ISP (image processing), fixed-function blocks (video, audio), etc. And while all of these pieces contribute to the overall user experience, some of them are difficult to quantify. The CPU and GPU remain vital to device performance and battery life, so it’s still important to probe their capabilities. Our initial testing shows that Snapdragon 835’s Kryo 280 CPU is an octa-core, big.LITTLE configuration with four semi-custom A73 “performance” cores and four semi-custom A53 “efficiency” cores. Kryo 280’s performance cores are pretty much equivalent to Kirin 960’s A73 cores in both integer and floating-point IPC, but comparing them to Snapdragon 820’s Kryo CPU shows mixed results: integer IPC improves but floating-point regresses. In our limited system testing, the Snapdragon 835’s IPC gains outweigh its losses, providing better overall performance than the Snapdragon 820/821 phones. Unsurprisingly, the Snapdragon 835 MDP/S matched the performance of the Mate 9’s Kirin 960, which may not sound all that exciting, but considering our positive experience with the Mate 9, it’s certainly not bad either. 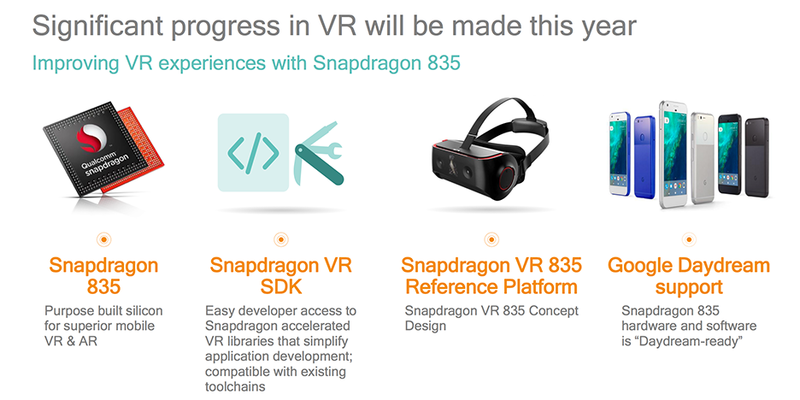 Qualcomm continues to push hard into VR/AR, not just with smartphones but stand-alone HMDs too. The high resolution and low latency requirements for these experiences suddenly make the GPU a bottleneck once again. The Snapdragon 835’s updated Adreno 540 GPU, through a combination of microarchitecture tweaks and a higher peak operating frequency, is another evolutionary step along the VR path, delivering a 25% peak performance boost over Snapdragon 820’s Adreno 530. 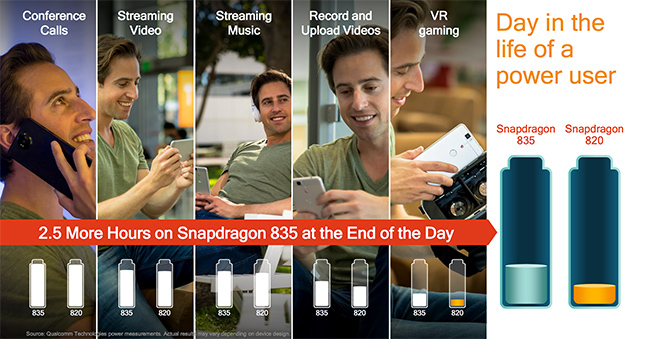 As noted earlier, all of these results came from pre-production hardware and software that’s under Qualcomm’s control, so performance could still go up or down once retail units begin shipping; however, based on these preliminary numbers and feature additions, the Snapdragon 835 looks like a solid evolutionary upgrade over the S820. The one glaring omission in this initial assessment, though, is power efficiency, which is critical to both battery life and sustained performance. The potential power savings from the move to 10nm and the CPU swap could have a larger impact on user experience than the small performance gains and new features. This is comparing apples to oranges. Unless the two CPUs run the same code, performance is irrelevant. The web is majorly a shitpile of bloat, ridden with inefficiency. Apple simply invested more time into optimizing their web / JS implementation. This is not really indicative of CPU performance, only of web implementation optimizations. And while it is true that apple's single threaded performance has been better, that is only a part of the story. You have the budget of n amount of transistors to put into x amount of total performance. If you have more threads, then obviously individual threads will be slower. Optimizing for low count threads is actually a pretty good idea given the typical mobile device usage patterns. 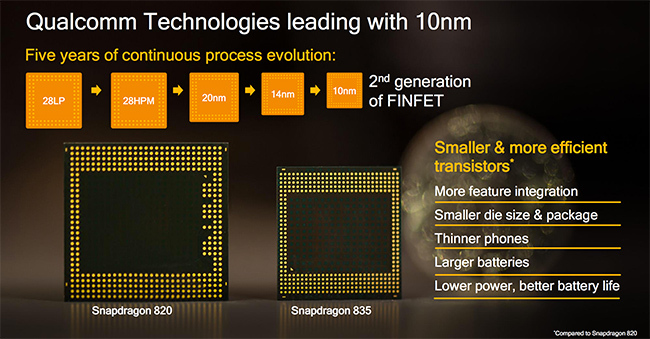 Why do most ARM chipmakers push for higher core count is a mystery to me. That is a STUPID strategy. It makes it that much harder to squeeze the most of your hardware. I've been running proprietary software on phones and tables since 2012, software designed to scale adequately, and as a result, I see better overall performance from flagship android devices despite apple's better ST performance, but only because of the kind of workloads I am running. So while the chips aren't anywhere nearly as slow as AT's lame benchmarking suite would suggest, it is not exactly straightforward to get the max of their performance. Lastly, the is this thing called "fast enough". Even if apple chips are traditionally faster in typical mobile applications than those found in android devices, this is not really an issue if the slower devices are still fast enough. I haven't really seen bottlenecks in the few 3rd party android apps I am using, so even with software that has not been designed to make use of many cores, things still run fast enough to not present an issue in regards with user experience. Apple has yet another advantage. Since it controls its ecosystem end to end it can optimize the software for their specific hardware. In the Android ecosystem you have configurations ranging from 1 to 10 cores (or more? ), so many different generations, so many different custom and semi-custom cores. A little trickier to optimize. So Android OEMs go for the numbers. Core numbers that is. Now with 25% more cores. Guess what? I have never seen any comparison between iPhone 7 and flagship Android phone with SD821 where iPhone 7 is faster in app and browsing site. These benchmarks mean nothing if you are using different platforms particularly OS. Bwaha PhoneBluff. Who launches 10 apps in a minute and close it right away with the home button? Retards? This "test" is broken. Instead of measuring each activity individually, the test mashes them all together and measures total time. This makes no sense whatsoever - users are interested in doing one thing at a time, so individual tests somehow reflect perceived speed of the device. Measuring all together is not how we use these kind of devices. Especially that a lot of those activities reflect the mass storage sequential read. So all PhoneBuff needed to have done to show his beloved device was the fastest, was to put enough application load activities and leverage faster IO.